Terence O'Brien's supeSenior Championship performances for Loup continued against Glen at the weekend. 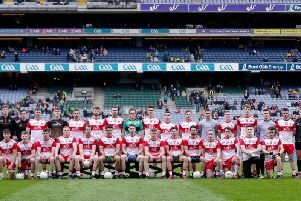 In a real quality game of championship football in front of an attendance of 3,409 at Owenbeg on Sunday evening a young Glen team failed to build on a dream start. They led by 0-5 to 0-1 after seven sizzling minutes but gradually the more experienced Loup reeled them in to lead by five at one stage. From the seventh to the 48th minutes, Loup outscored their younger rivals by 0-14 to 0-6 and in the end were deserving winners despite a belated Glen fight back. Glen will look back on some costly errors that might have turned the game. Michael Warnock who had scored three brilliant early points but then got a black card; Emmett Bradley was not his usual self on the frees and they allowed The Loup to push up on their kick-outs, an area where they surrendered four costly points. At the start of the second half they lost one of their best forwards, Danny Tallon, with injury. He went down injured early in the game but carried on as far as he possibly could. Loup now meet Ballinascreen in the semi-final with a place in the county final against Ballinderry, Slaughtneil or Banagher at stake. Ex Derry star, Johnny McBride, himself winner of two county championship medals, has this Loup team in prime condition. They play nice football and are superbly fit. They have the top goalie in the county in Thomas Mallon who proved his worth with a fantastic first half save from Emmett Bradley at a stage when they were struggling to stay in the game. When The Loup wrested control at midfield through Aidan McAlynn and the highly skilled Terence O’Brien that proved to be the fulcrum for their victory. They came from four points down after seven minutes to be level at half time and at the three quarter stage, they had pushed into a five point lead with an amazing five point scoring blitz between the 45th and 49th minutes. Once they got that lead they were never going to be caught. They bulked up their defence and held out in the face of a late Glen comeback. The decision to defend could have proved costly as Glen hit a brace of points and with a bit more accuracy could have closed the gap a bit more. It took Michael Warnock only 22 seconds to put Glen ahead but Loup quickly levelled through O’Brien. Then Warnock went on the rampage with two brilliant points and when Paul Gunning hit the target Glen were 0-5 to 0-1 in front after just seven minutes. Loup looked stunned but gradually found their feet and by the 19th minute they were level with scores from Aidan McAlynn, Paul Young, Declan McVey and an Anthony O’Neill free. Glen, after 17 scoreless minutes edged ahead with a Tallon free but Declan McVey quickly restored balance. The loss of Michael Warnock to a black card in the 24th minute was a huge blow for the Maghera man with the sides locked at 0-7 a-piece at half time. It was more of the same in the first 13 minutes of the second half when the teams were tied at 0-10 each but then it all went wrong for the Watty’s. Loup hit the next five points after pushing up on the Glen kick-outs and returning them over the bar. The game was won and lost in that five minute spell. First Anthony O’Neill levelled from a free. Terence O’Brien with a quite superb point put his team on the victory trail. Glen were all over the place when Ciaran Devlin won the kick out and sent the ball back over the bar. In the next 90 seconds both Paul McVey and O’Neill availed of similar situations for a 0-14 to 0-10 lead. O’Brien, who was bossing midfield, then landed a mammoth free but it took good hands from Thomas Mallon to cut out a Paul Gunning cross as Glen refused to surrender. Glen battled on but Loup held firm for a deserved win though all credit to young Glen team for their part in a superb game of championship football. Loup scorers Terence O’Brien and Anthony O’Neill and Cairan Devlin 0-3 each, Declan McVey 0-2 Brian Doyle, Paul McVey, Aidan McAlynn, Paul Young, 0-1 each. Glen scorers Emmett Bradley 0-4, Michael Warnock 0-3, Conor Convery 0-2, Paul Gunning, Philip O’Connell and Conor Carville 0-1 each.